With the Backdraft GT+ putter, white is back and better than ever. 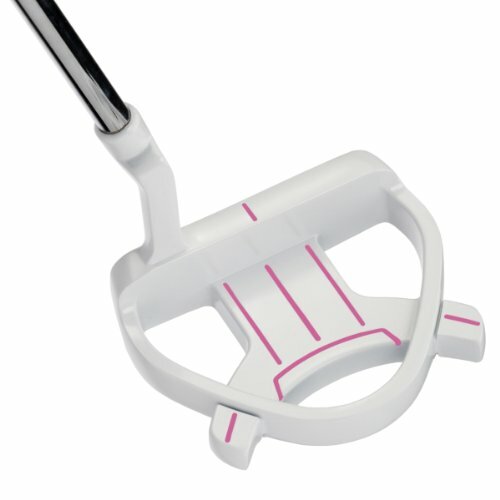 The high-contrast head and jumbo size grip are unique technologies never before combined in putter design. These performance enhancing features deliver unprecedented level of accuracy and forgiveness to every golfer's game. The Backdraft GT+ uses Optic Technology to increase the contrast between the putter head and the green. The difference between our GT+ putter and darker putters is a higher level of contrast that helps you focus on the Backdraft's leading edge and alignment aids, giving you the best possible visual presentation for accurate aim. The more contrast, the easier an object is to see, and the easier it is for you to focus. The inherent feeling of being focused promotes confidence; and believing in your putting stroke just might be more important than any other aspect of putting. In addition, the Backdraft GT's color eliminates distracting reflections off the club head allowing golfers to concentrate on setting up the perfect line. All of this alignment technology is only half the story. The GT's jumbo grip helps prevent the golfers' wrists from breaking down making it easier to create a pure and fluid putting stroke. In addition, the jumbo grip reduces grip pressure and minimizes club head rotation for a softer touch and more pure putting stroke. Jumbo grip minimizes wrist break down for a more pure stroke. It also reduces grip pressure and helps to reduce club head rotation to help golfers find the hole more often. These deep center of gravity putters span from traditional and popular blade models to high MOI mallet styles models. All feature GT+ putters feature our new alignment aid. High moment of inertia (ability to resist twisting) heel and toe weighted designs keep the putter square throughout the stroke so more putts find the hole. Easy-to-use alignment aid, the same width as a golf ball, features a centered sight line. Plus, a TPE insert for responsiveness and a true touch.